But alas, only the left is that firm in their convictions. I agree about protesting, but it takes organization, money and a lot of otherwise unemployed individuals to generate a protest. We on the right generally have access to fewer of the type that can be hustled over to a protest on practically a moment's notice. That dog will not hunt...the coming boom is going to be sonic. Definitely a new form of protest has to evolve. For now that is the voting booth. So the FBI sent spies into the Trump campaign looking for Russians! So why didn't they send spies when Bobby Boy went to Moscow with yellow cake samples? The FBI should be dismantled. It has no reputation left. The people behind this should be hung for treason. 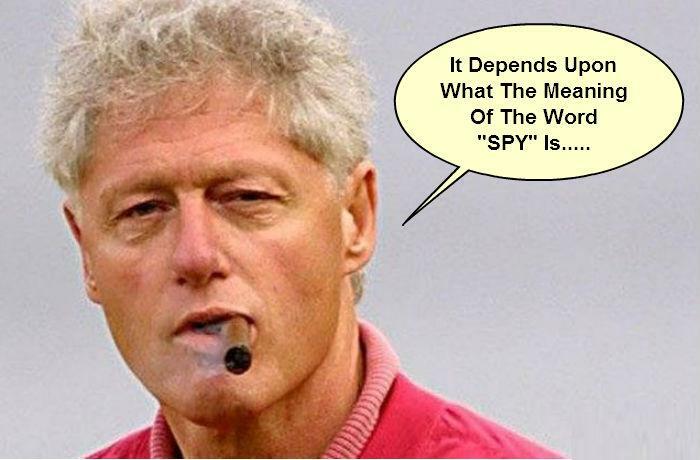 So the narrative has shifted from "Trump is crazy, there was no spy," to "Trump is crazy, they weren't spying on him, they were protecting him." So the spinners have been war gaming this scenario for the past year and their opening salvo is it was a legit to save the Republic! Slam that crap right down their necks. Great point. I doubt you will get an answer from these scumbag Journos. They are fully complicit before and after the fact. Oh look. Trump was right. Some of the media reporting seems to be engaging in a word game. What is an informant, oh no it was a “confidential source”? Uh I guess a confidential sources is a “prostitute” in their minds, a way to dress up “informant” which I guess everyone knows to be some lower term. This is felony on top of felony. I am certain that had President Bush taken the very same approach with the presidential campaign of Barak Hussein Obama, the NYT would have been just fine with that, right? OK. Fine. And what did they learn?